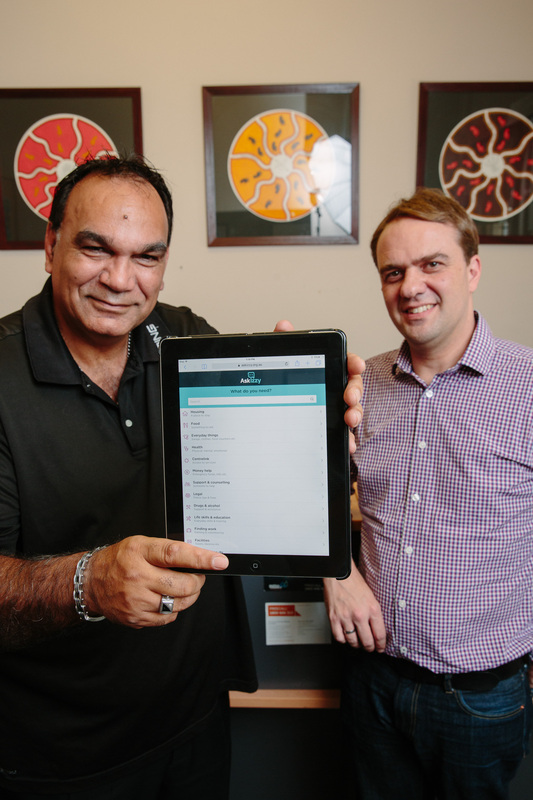 Ask Izzy, the mobile website that connects people who are homeless with essential support services, is being expanded to improve Aboriginal and Torres Strait Islanders’ access to health and wellbeing services. Victoria’s history continues to adversely affect Aboriginal and Torres Strait Islanders, who makeup almost a quarter of people supported by homelessness services and are twice as likely to visit hospital for preventable conditions. Our CEO, David Spriggs, says mobile technology provides an easy way to help people find support, because almost 80 percent of people who are homeless own a smartphone. 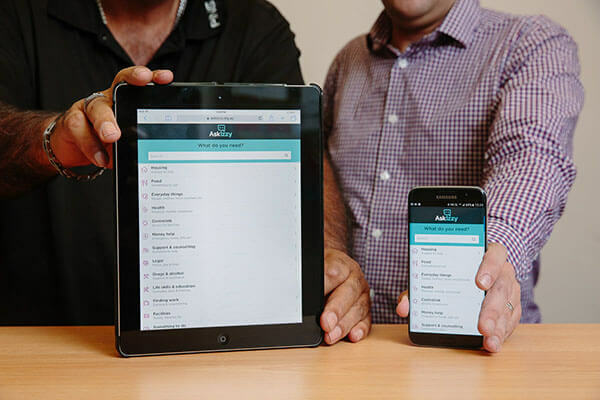 Ask Izzy is free and anonymous and lists over 350 000 services across Australia. Dan Laws from Ngwala Willumbong and David Spriggs, CEO of Infoxchange. “People experiencing homelessness often have complex health needs and if we can play a small part in helping them address just one of these issues, it can make a huge difference,” David says. “First, we need to make sure Ask Izzy is culturally safe for Aboriginal people and that it provides information that speaks to them. 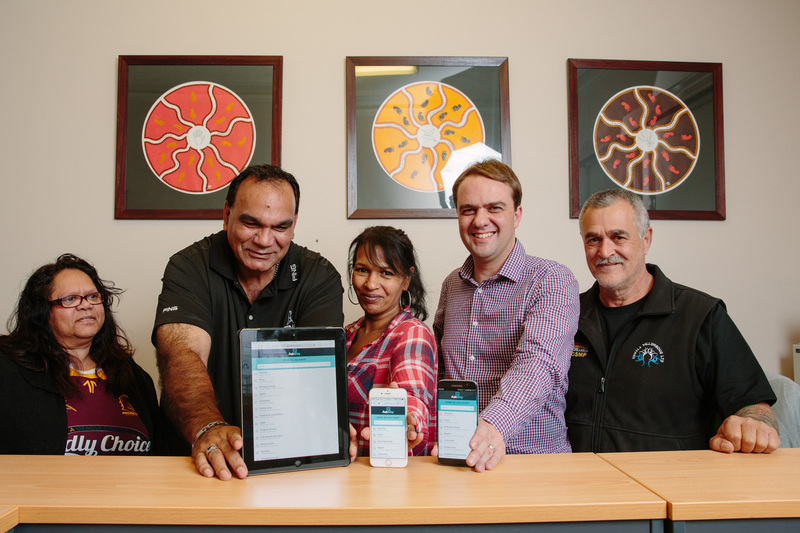 The Infoxchange project is funded under the Victorian Government’s $11 million Public Sector Innovation Fund and builds upon a trial that was run in Healesville and Wodonga with the Department of Health and Human Services. Launched in January 2016 by the Prime Minister, Ask Izzy is being used by many people who are homeless or at risk and over 10 percent of users are Aboriginal. “With over 272 000 searches made for food, health, shelter and other services so far, the demand for a product like Ask Izzy is sadly very clear,” David says. The Ngwala Willumbong team with David Spriggs. Ask Izzy was developed by Infoxchange in partnership with Google, realestate.com.au and News Corp Australia. Ask Izzy for Victorian Aboriginal Communities is funded by the Victorian Government’s Public Sector Innovation Fund.